Greenline Coaches is a family business owned and operated by Allen and Sharon Fretwell. Greenline can provide a tour coach or bus to suit the needs of travel tour organisers, either for international or local clients. Greenline takes pride in providing high-quality customer service, using modern vehicles which are driven by competent, courteous and friendly drivers. The Greenline fleet comprises luxury buses, school buses, charter vehicles and mini-vans - something to suit your needs! Greenline has been operating out of Morrinsville for over thirty-five years. The Greenline depot in Morrinsville includes offices, mechanical workshop, undercover parking for vehicles as well as parts and painting areas. The Greenline depot in Auckland makes certain that the company is close to the Auckland International Airport, a busy and exciting entry point for most visitors to New Zealand. Greenline's aim is to ensure that their tour coach business provides a quality experience for visitors so that they have an exciting and memorable time while they travel around New Zealand. Ministry of Education school bus routes are operated by Greenline for all Morrinsville and district schools during the school year. We are very proud to be running this service within our community. Greenline has achieved the Qualmark NZ Limited accreditation. 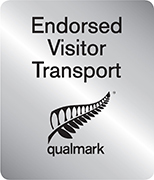 Qualmark is New Zealand Tourism's official mark of quality and certification which endorses us as a professional and responsible passenger transport operator within the tourism industry.